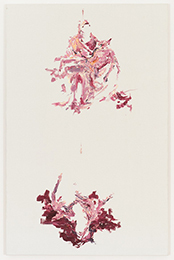 STEVENSON is pleased to present a solo exhibition by Wim Botha, his seventh with the gallery. Botha's new body of work is singularly focused on Michelangelo's first Pietà, engaging with the marble original using similarly traditional materials, such as bronze and oil paint. 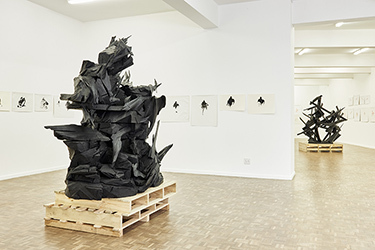 Following his 2004 Mieliepap Pietà, a life-size replica modelled from maize meal, Botha exhibits a full-scale bronze extrapolation of the Pietà initially carved from polystyrene blocks; a suite of 119 studies on canvas and paper; and a drawing in three dimensions. The works both support and disrupt the ideological, conceptual, material and historical meanings inscribed in the iconic 15th century piece. 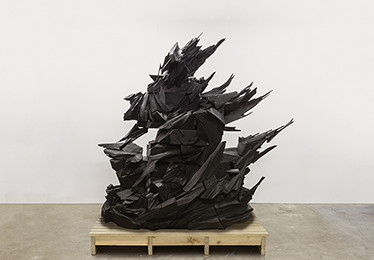 The sculpture Prism 13 (Dead Pietà) is a radically splintered version of the original, its contours and surfaces opened up by slashing at the polystyrene with a chainsaw and wire cutter. This blackened and blurred bronze operates like a negative of the original, whose surfaces have now been stretched and contorted into what appears to be a flash image modelled at lightning speed. The overall silhouette of jagged and exploding outlines pushes any memory of the original far away from reach - as if it has been subjugated to the accumulative effects of time and context - offering us an eroding version of this symbol of sorrow and loss. 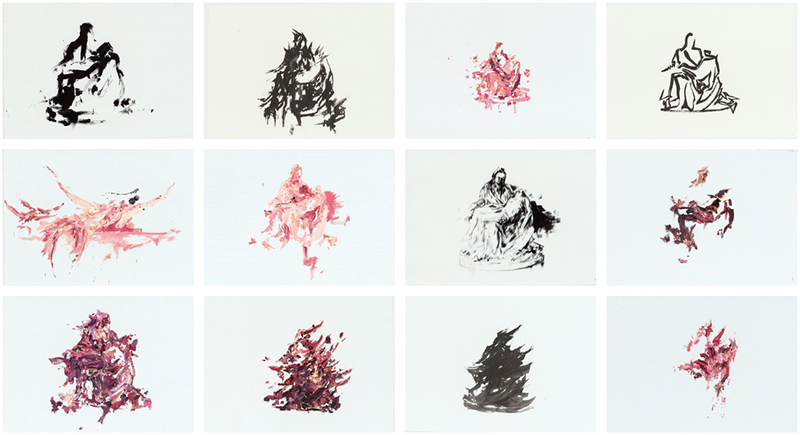 More's the pity, an installation of 119 oil on canvas and ink on paper sketches, depicts Michelangelo's Pietà as an almost cinematic experience. 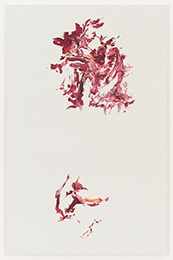 Based on a single-source mirror image of the classic frontal view, Botha uses his repetition of the underlying image as an opportunity for a gradual experimentation with form and colour, the recognisable and the abstract. 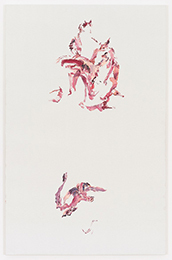 Presenting the sketches in a linear and chronologically intact sequence, a serialised depiction of the single-source image is formed that, when seen together, appears to reanimate the figures. 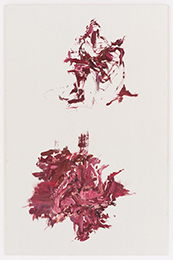 Through this process the iconic image of the Pietà is subjected to a formal and conceptual transformation, becoming more and more visceral even as it appears to endlessly disintegrate. 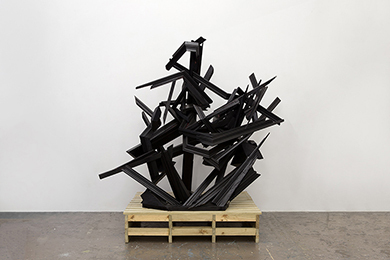 Forming a conceptual bridge between the bronze sculpture and the sketches, Untitled (line drawing) utilises sections of wood, some with a neo-classical profile, joined together to form an angulated mass of black lines. Held in a tension between collapsing and exploding, this geometric exploration of the Pietà's space and volume erases any trace of the figures. 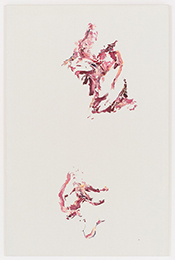 By removing their identities, the tangle of lines and rhythm sustains some of the emotional content of the original, even as it renders form and narrative equivocal. 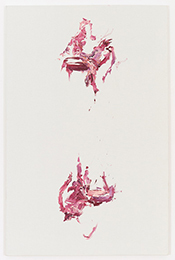 Botha is the recipient of a number of prestigious awards, including the Helgaard Steyn Prize for Sculpture (2013), the Standard Bank Young Artist Award (2005) and the first Tollman Award (2003). 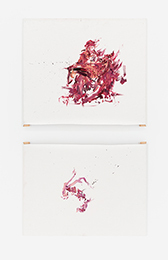 Recent solo exhibitions have taken place at the National Arts Festival in Grahamstown (2014); Kunstraum Innsbruck, Austria (2013), and the Sasol Art Museum, Stellenbosch, as the Stellenbosch University Wordfest Artist for 2013. Notable group exhibitions include the touring exhibition The Divine Comedy: Heaven, Purgatory and Hell Revisited by Contemporary African Artists, currently at the Smithsonian National Museum of African Art in Washington, DC; Lichtspiele at Museum Biedermann, Donaueschingen, Germany (2014); Imaginary Fact: South African art and the archive, South African Pavilion, 55th Venice Biennale, Italy (2013); Artists Engaged? 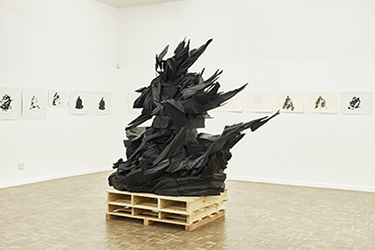 Maybe, Fundação Calouste Gulbenkian, Lisbon (2014); Memories of the Future: The Olbricht Collection, La Maison Rouge, Paris (2011); Pandemonium - Art in a Time of Creativity Fever, Göteborg Biennial, Sweden (2011) and the 7th Dakar Biennale, Senegal (2006). 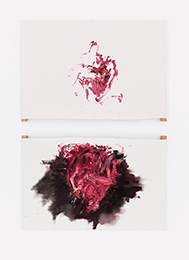 Related press: Philip van Emmenis reviews for art.co.za (24 August 2015); Alexander Opper reviews for Artthrob (21 September 2015). The gallery is open from Monday to Friday 9am to 5pm and Saturday 10am to 1pm.